Welcome to the Paradise Island of Bali!!!! Bali Griyasari Tours & Travel is a unique Family tourism service who is dedicated to bringing the very best of Bali to You. Many of tours have been designed specially for our clients, and we appreciate your thoughts and comments about them. We are ready and available any time you need, and we have a special 24 hrs number if you are in need of assistance. Bali, well known as a paradise island, a land of a thousand gods, thousand temples, thousand dances, is located between the Pacific and Indian Ocean, just below the equatorial line, on latitude 8 degree south and longitude 115 degree east. The island is considered to be the most attractive island to visitors. It is estimated that the were more than 3.000.000 visitors a year from all round the world. Most of them seek an understanding of a way of life that is really unique. Bali is unique as having the last dominant and still intact spiritual culture. Many of the traditional rituals and practices are just as alive today as they ever were, and the strength and resilience of the Balinese people and their culture is a testimony to the richess of their faith. Most of Bali’s 3,1 million people live in villages in the central southern plains and in the capital towns of the eight Kabupaten or regencies. Balinese society is collectivist and place oriented. Villages are organized around community temples, and collectively run by village councils called banjar. This social structure remains strong,even in urban areas.Family compounds often contain three generations and three generation and three or four nuclear families, and each compound has a house temple where the ancestral deities are honored. Customary law is imbued with communal religious duties. International points of entry into Bali, Indonesia, are the Ngurah Rai Airport Denpasar (DPS) and the sea ports at Padang Bai, Benoa and Gilimanuk. Before making your travel plans to any worldwide destination, we strongly recommend you authenticate important details regarding all applicable health, passport and visa requirements. A 30 days single entry visa is granted upon arrival to more than 60 nationalities incl. Australia, Germany, Switzerland, Japan, Korea, France, Spain, Holland and many more (see list at bottom of this page). The cost is US$ 35. You can also pay in some other currencies (EUR or AUS$), you will get your change in IDR. There is usually no problem to obtain a visa on arrival (VoA). But your passport must be valid for at least another 6 months. On the plane you will receive an immigration card. Fill it in (see details below). You should have a return flight ticket (reservation printout), they rarely ever ask for it, but it could happen. NOTE: The VoA is NOT VALID FOR ONE MONTH. Only 30 days. The day of arrival counts as day one. If you stay longer you will have to pay a penalty of 200.000Rp per day. Up to 3 days is usually no problem, you will simply pay the fee at the immigration counter. Quite a few travelers end up paying the additional fee (penalty) because they wrongly assume, that the visa is valid for a month or because they do not know, that the first day of arrival already counts. In the airplane you will be given an immigration card to fill in (Arrival and Departure Card). You will need your passport details, flight details and address in Indonesia (Hotel Name and City is mostly enough). Make sure you sign the card at the bottom of the second page! You will also be given a tax card. Just tick everywhere “no” unless you need to declare something of course (it is not allowed to bring in cash of more than US$ 10.000!). Officers will collect the card when you exit through customs. VISA on Arrival (VoA) – This facility is now available for nationals of the following countries: Algeria, Argentina, Australia, Austria, Bahrain, Belgium, Brazil, Bulgaria, Cambodia, Canada, Czech Republic, Denmark, Egypt, Estonia, Fiji, Finland, France, Germany, Greece, Holland, Hungary, Iceland, India, Iran, Ireland, Italy, Japan, Kuwait, Laos, Latvia, Libya, Lichtenstein, Lithuania, Luxembourg, Maldives, Malta, Mexico, Monaco, New Zealand, Norway, Oman, Panama, People’s Republic of China, Poland, Portugal, Quatar, Romania, Russia, Saudi Arabia, Slovakia, Slovenia, South Africa, South Korea, Spain, Suriname, Switzerland, Sweden, Taiwan, Tunisia, United Arab Emirates, United Kingdom and the United States of America. Citizens of these countries will be able to apply for a VoA valid for 7 or 30 days. The 30-day visa costs US$25 per Person. The Visa on Arrival is non-extendable and cannot be converted into a different visa. Once you have paid for and received your visa you will need to proceed to Immigration where your visa will be processed. Visitor passports must have at least six months before the expiry date and one empty page. Brunei Darussalam, Chile, Hongkong Special Administrative Region, Macao Special Administrative Region, Malaysia, Morocco, Peru, Philippines, Singapore, Thailand, Vietnam. Next go to the immigration counters and queue according to the appropriate signs. Long queues after a long flight are still happening, but getting less. If you have not yet arranged a pick-up, no problems, walk towards the blue TAXI SERVICE counter. They work with a fixed price list and the price depends on the area you want to go to. You can’t get a metered taxi at the airport – there is no real easy alternative. The prices are not too bad. Expect to pay around US$ 8-10 per taxi for the main tourist areas in the south. E.g. Umalas, Kerobokan is currently 120.000Rp. Remote areas can cost you up to $30. Tell the assistant your destination or hotel name. Arguing the price they quote is of no use if you feel that the price is too expensive or if you think your hotel is not in Seminyak, but in Legian. You need to pay CASH to the driver after he dropped you. So if you plan to get a taxi, remember to change some money at the counter just outside. Tipping is common but not a must. Bali is the western most island in the Lesser Sunda Islands of Indonesia. The island is located west of Java and east of Lombok. With a population of over 3 million with the vast majority of the island’s population, 93.18%, being Hindu makes this place very different from the rest of Indonesia. 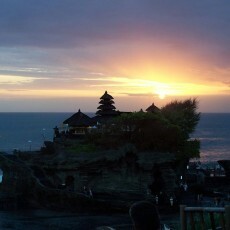 Bali is one of the largest tourist destinations in Asia and the largest tourist spot in Indonesia. The island was first settled around 2000 BC by people from Taiwan. The culture took a major shift when Hinduism was introduced from India in the 1st century AD. When the Hindu empire on Java fell in the 15th century most of the intellectuals, priests, musicians and royalty relocated to Bali. The Dutch discovered the island in 1597, although Dutch control was not solidified untill the 1890s. Even then Dutch control was loose at best. After Indonesian independence the island was hit hard during the communist crackdowns of the 1950s and 1960s with 10% of the islands population being executed. In 2002 and 2005 bombs were set off in major tourist areas, which greatly affect the tourist industry. The main attractions for tourist going to Bali are the stunning beaches, amazing mountains, art work, dance, music and pumping nightlife. On top of this there is extremely clean and clear water that are filled with coral reefs, which makes for world class diving. For adventure seekers there is some of the best surfing in the world and excellent mountain climbing. 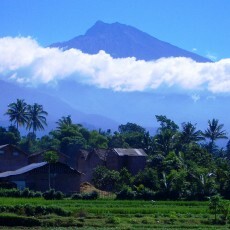 Bali has a tropical climate with hot, humid conditions. Temperatures are mostly between 30 and 32 °C during the day and nights are still well above 20 °C. The mountains in the interior are cooler and see more clouds as well. The April-October period is the dry season and November-March is the rainy season, though showers are still possible during the dry season and periods of dry weather occur during the monsoon season. Annual rainfall is about 70 inches in the south central plains with an average of two hundred days of rain per year. East Bali and the north coast may get only 2-3 inches. Temperatures range from 60o F to 85o F, depending on season and altitude. Bring a light jacket if you plan to go to into the mountains. Daylight is from about 6 AM to 6 PM year-round with slight variations between June and December. Generally 220-240V, 50 cycles AC. Some villages may have 110V, 50 cycles AC. Power is in greater demand than supply, and shortages are common. Some outlying areas do not yet have any electricity. Outlets are the European standard CEE-7/7 “Schukostecker” or “Schuko” or the compatible, but non-grounded, CEE-7/16 “Europlug” types. American and Canadian travellers should pack a voltage-changing adapter for these outlets if they plan to use North American electrical equipment (although a lot of electronics with power adapters will work on 220 volts, check your equipment first). It’s a good idea to carry a small flashlight with a spare bulb and batteries.Most large hotels provide hairdryers and electric adapters. Dress is normally informal in Indonesia due to the warm, humid climate and clothing of light-weight fabrics are recommended. Highland areas are noticeably cooler, however, and carrying a light sweater is suggested. Acceptable attire for men is a shirt and long pants. A jacket and tie are required for offlcial calls or for more formal occasions. Long-sleeved batik shirts are acceptable for evening functions. For ladies, dresses, blouses, and long pants are appropriate. Shorts, halter tops or tank tops should only be used at sports facilities or on the beach. Temple visits require long pants or long skirts. Balinese and Indonesian are the most widely spoken languages in Bali, and the vast majority of Balinese people are bilingual or trilingual. The most common spoken language around the tourist areas is Indonesian, as many people in the tourist sector are not solely Balinese, but migrants from Java, Lombok, Sumatra, and other parts of Indonesia. There are several indigenous Balinese languages, but most Balinese can also use the most widely spoken option: modern common Balinese. The usage of different Balinese languages was traditionally determined by the Balinese caste system and by clan membership, but this tradition is diminishing. Kawi and Sanskrit are also commonly used by some Hindu priests in Bali, for Hinduism literature was mostly written in Sanskrit. English is a common third language (and the primary foreign language) of many Balinese, owing to the requirements of the tourism industry. Other foreign languages, such as Chinese, Japanese, Korean, French or German are often used in multilingual signs for foreign tourists. The Indonesian Rupiah is the local currency, normally abbreviated to Rp followed by the value. Denominations of Rp.100 and 100 are in the form of coins, 500 and 1,000 are in either coins or bills, and Rp.5,000, 10,000, 20,000, 50,000 and 100,000 are only available in bills. In Bali, carry a handful of Rp.10,000 to Rp.100,000 notes for your daily expenses. Backing this up with a credit card for major purchases is a good idea. Take note though, most mid-range hotels, all top-end hotels and some tourist attractions, car rental agencies and tour companies list their prices in US dollar. The Rupiah is still acceptable in these establishments but the exchange rate is usually more advantageous to the vendor than the tourist. Plastic Money – Many shops accept credit cards and charge cards but often add 2-3 percent to your bill. Visa and Mastercard are accepted by most – American Express and JCB is getting much less accepted. The amount signed for and charged is in Rupiah and the bill is then converted by the clearing banks to your domestic currency. ATM – Automatic Teller Machines are mushrooming all over the island, especially at shopping centers and bank branches. Most of them are connected to international banking networks thus making it possible to look for machines that are affiliated with your own ATM network. You can draw usually between 1.2mio and 2.5mio in one go. So if you need more money you will have to pull several times adding to the bank charges, as each transaction counts! Banks – Most major banks have branches in the main tourist centers and provincial capitals. Banking hours are generally from 8 a.m. to 2 p.m. Monday to Friday and until 11 a.m. on Saturdays. Foreign currency, whether in banknotes or traveler’s checks, should be exchanged at major banks or authorized money changers (PT. Central Kuta is highly recommended). Bewhare of changing tricks ! The US dollar and nowadays the EURO are the preferred foreign currency in Bali; bring always new, clean US$ bank notes which are not damaged in any way. If for instance a corner is missing or someone scribbled something on an otherwise perfect bill, hardly anybody will accept it at full value – or at all. Forget about dollar bills older than 2007. Exchange rates offered by money changers are generally better than by the banks, they stay open longer and transactions are faster. Sometime for US$100 notes better exchange rates are offered than for US$10 or US$20 bills. The authorised money changer at the airport may offer lower rates than in the more popular tourist areas, so be sure to have a small note (no larger than about $10 or $20) ready to cash there, and move on to Kuta or an alternative location to cash larger amounts. Shopping in Bali is not simply walking into a shop, picking something from a shelf and paying for it. Shopping is an art. In every traditional market and art shop around Bali bargaining is a must. This traditional way makes shopping in Bali a fun time, where you can feel the warmth of human value in every transaction. Before you begin your shopping tour on this island, please obtain cash because most places do not accept credit cards. In every traditional market and art shop around Bali bargaining is a must! Even if you are not a seasoned negotiator be prepared to enjoy the bargaining process. It is a fun activity and be patient and you will get the ‘best (and maybe even local) price’. In some places you can bargain until you get 50% off. Always go in at less than a third of the price (maybe even a quarter) and bargaining and even walk away, until you get the price you want. Then make sure you pay the right money. When bargaining, keep in mind the notion of a fair price. Business offices are usually open either from 8.00 am to 5.00 pm or 9.00 am to 5.00 pm, with a break for lunch between 12.00 noon and 1.00 pm. On Saturday many business offices are closed. Government office hours are from 8.00 am to 4.00 pm from Monday to Friday, and on Saturdays many Government offices are closed. Most of the roads hug the coastline or the edge of the mountains. Due to the steepness of the mountains in the interior of the island there are very few roads across the island, although some take you to the central volcanos. A car with a driver is relatively cheap if you share with a few more travellers and gives you maximum flexibility regarding the route and sights. Please check also our tours and rent car offers ! Ngurah Rai Airport Taxi has the monopoly on the taxi service out of the airport. No other taxi company is allowed to have a service counter in the airport. For up to 3 people travelling together, it’s cheaper to use the taxi, as long as the luggage fits into the boot/trunk. Bali taxis are divided into two groups – Bluebird taxis, then all the others. Bluebird taxis have earned a reputation for being honest dealers in the often-corrupt taxi industry. Non-Bluebird taxis, on the other hand, are known for dirty tricks – not using their meter and taking roundabout routes, among other things. Need a taxi anywhere in Bali? Just stand by the side of the road, lift your arm, and a taxi will stop to pick you up. Taxis in Bali are plentiful, with one at almost every corner, at least in South Bali. Getting around by taxi is cheap on Bali, however you need to know a few rules. Bluebird Taxi Drivers follow strict company regulations to switch on the meter immediately. With other companies you might have to insist or remind them. In some areas such as in Ubud or Tanah Lot the local community manages the taxi service. Other taxi companies are not allowed to operate. These are “private cars” without meters, and you need to fix a price with the driver AFTER BARGAINING. Prices depend on distance and time of the day. Major hotels usually add a 11% service charge to bills. Where it is not included a tip of between 5% to 10% of the bill would be appropriate if the service is satisfactory. Airport porters expect Rp.2,000,- for a small bag and Rp.3,000,- for bags weighing more than 20 kg. Tipping taxi and hire-car drivers is not mandatory, but if service has been satisfactory a basic Rp.1,000,- tip is sufficient for a taxi driver. Hirecar drivers would normally expect a larger tip. Bali has, without a doubt, the best range of accommodation in Indonesia, from Rp60,000 per night ($6) losmens to US$4,000 per night super-homes. The backpackers tend to head for Kuta, which has the cheapest digs on the island. However, if the accomodation is located near a night club they can be noisy at night. One quiet and clean place in the cheaper catagory is Hotel Oka in Jalan Padma in Legian, only a kilometre from the night clubs of Kuta and walking distance from the beach. Many of the numerous five-star resorts are clustered in Nusa Dua, Seminyak and Ubud. Sanur and Jimbaran offer a fairly happy compromise if you want beaches and some quiet. Ubud’s hotels and resorts cater to those who prefer spas and cultural pursuits over surfing and booze. Legian is situated between Kuta and Seminyak and offers a good range of accommodation. The newest area to start offering a wide range of accommodation is Uluwatu which now boasts everything from surfer bungalows to the opulent Bulgari Hotel. 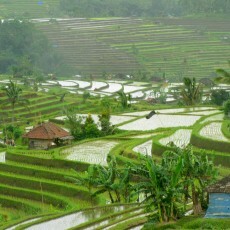 Further north on the west coast is the district of Canggu, which offers many traditional villages set among undulating ricefields and a good range of accommodation. For rest and revitalisation, visit Amed, an area of peaceful fishing villages on the east coast with some good hotels and restaurants, or head for the sparsely populated areas of West Bali. Please check our Hotel Booking Site Compare and book the cheapest rates !!! Bali has become famous for its large collection of private villas for rent, complete with staff and top-class levels of service. Low labour costs result in single villas boasting staff teams of up to 30 people at the really high end. A private villa rental can be a great option for a visit to Bali, but it pays to be aware of the potential pitfalls. Not every place sold as a villa actually fits the bill. Prices vary widely and some operators claim to go as low as US$30 per night (which usually means a standalone bungalow on hotel grounds with little actual privacy). Realistically, you will be looking at upwards of US$200 per night for anything with a decent location and a private pool. At the top of the range, nightly rents can easily go north of US$1,000. The general rule of you get what you pay for applies here. There are, of course, exceptions, but a 4 bedroom villa offered for US$400 and one for US$800 per night will be different in many ways—the standard of maintenance, the number of staff and their English ability, and the overall quality of furnishings and fittings in the property. Please check our Bali Villas for rent !! !